9 Things To Know About The Senate Health Care Bill : Shots - Health News Senate Republicans are calling their health care bill the Better Care Reconciliation Act. It shares many provisions with the House's American Health Care Act, but goes further in cutting Medicaid. "We agreed on the need to free Americans from Obamacare's mandates. 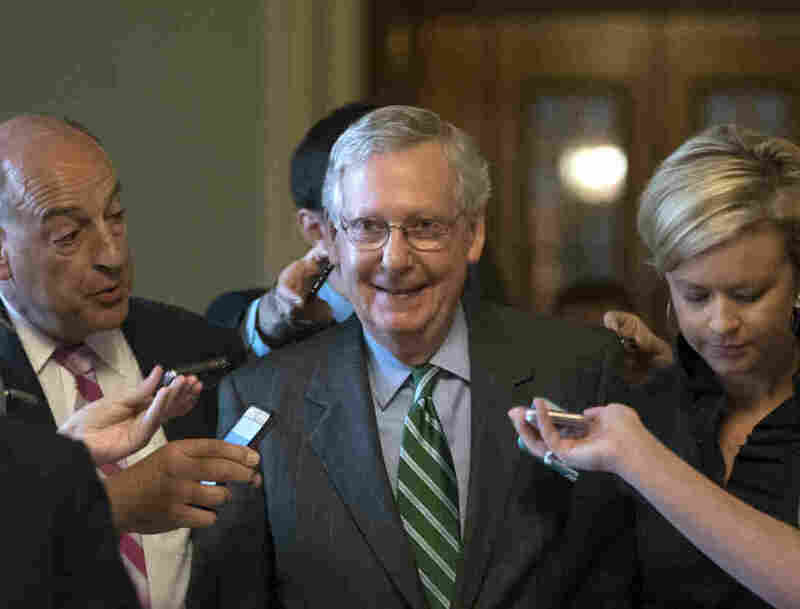 And policies contained in the discussion draft will repeal the individual mandates so Americans are no longer forced to buy insurance they don't need or can't afford," McConnell said. "The bill will encourage a lot more of those individuals to buy health insurance," Roy says. "That, in turn, will make the risk pool much healthier, which will also lower premiums. And the tax credits in the bill will also be better-designed." But Caroline Pearson, a senior vice president at the consulting firm Avalere Health, says the bill bases its tax credits on lower-quality insurance. "If you're paying a similar percentage of income, you're getting a less generous product under this new plan," she says. The plan keeps some popular parts of Obamacare. It allows parents keep their children on their policies until age 26 and requires insurers to cover people with pre-existing conditions. But it then allows states to opt out of that requirement. "The protections around pre-existing conditions are still in place in the Senate bill, but the waiver authority gives states options that could include limiting coverage for people with pre-existing conditions," says Pearson. Those waivers would allow state to drop benefits required by Obamacare, such as maternity coverage, mental health care and prescription drug coverage. Both bills would eliminate most of the taxes imposed by the Affordable Care Act. And they would bar people from using tax credits to buy policies that pay for abortion and also block Planned Parenthood from getting any money from Medicaid for a year. Perhaps the most sweeping move, however, is that the Senate plan follows the House lead in completely changing how the government pays for health care for the poor and the disabled — and goes even further. Today, Medicaid pays for all the care people need, and state and federal governments share the cost. But Medicaid has been eating up an ever-larger share of federal spending. The Senate Republicans' plan puts a lid on that by rolling back the Obama-era expansion of the program and then granting states a set amount of money for each person enrolled. Republicans also want to change the way the federal government calculates payments to the states starting in 2025, reducing the federal government's contribution to the states. "The Medicaid cuts are even more draconian that the House bill was, though they take effect more gradually than the House bill did," Pearson says. "So we're going to see very significant reductions in coverage in Medicaid and big cuts in federal funding that will result in significant budget gaps for states." Several Republican senators have already said they oppose the bill, at least as of now. Senate leaders are aiming for a vote before July 4.